No matter how regularly you toss out your old leftovers and clean up spills, your refrigerator will eventually begin to smell. Fish, onions, and other strong-smelling foods leak their smell into the fridge no matter how well you seal them up. It’s important to regularly clean out your fridge. Toss out old food and wipe down the walls and shelves with water and a mild soap. A box of baking soda tucked into the corner of your fridge is also an effective tool for absorbing odors between cleanings. Trash cans tend to stink, but they don’t have to. Using the right sized trash bag and making sure it doesn’t slip down will help to keep odorous foods from gathering at the bottom of the can, but that won’t permanently prevent the smell. It’s a good idea to clean garbage cans out every so often using soapy water or vinegar and water. To cut down on smelly foods stinking up your kitchen before you have a chance to take out the trash, there are a few home remedies you can use. Citrus peels, coffee grounds, or baking soda on the bottom of the garbage bin will absorb or cover up the smells emanating from your trash can. The same remedies can work temporarily on outdoor trash cans, but for a more permanent solution, there are companies that you can schedule to come by and clean your bins. If there’s a rotten egg smell in your home (but you haven’t had eggs in a while), you need to call a plumber ASAP. This smell is added to gases to alert you to gas leaks in your home. A plumber can determine if the smell is due to a natural gas leak, a propane leak, or a sewer gas leak and then get the problem fixed before it gets worse or becomes dangerous. Mold and mildew tend to grow in airtight front-loading washers. If your washing machine starts to smell, run a wash cycle with nothing but two cups of bleach and your washer on its hottest setting. Since diapers don’t really work on dogs, you’ll likely have to deal with a new puppy peeing on your carpet until it’s trained. The solution to removing the stains and odors of pet urine is the same solution to your science fair project dilemma: baking soda and vinegar. Sprinkle some baking soda on the carpet and then use a spray bottle to spritz on some vinegar. After it dries, vacuum it up, and the carpet will look and smell a lot better. When your teenage son takes off his socks after football practice, you may be tempted to burn those gag-inducing lumps of sweaty cotton. But there is a better option. After yelling at him to toss them in the hamper, sprinkle some baking soda over the laundry to absorb the smell. When an animal dies in the walls, the smell is horrible, and it’s difficult to remove the cause of the smell. A simple home remedy may remove this disgusting smell from your room. Put some vinegar in a cup, place a lid on top, and punch some holes in the lid. Place the container in the smelly room and wait a few days. The vinegar will absorb the smell . . . and then release its own scent into the room. But vinegar smells better than a dead animal, and the vinegar smell will dissipate over time. A wet towel left crumpled on the floor for a few days will begin to smell foul. To remove the mildew from the towels, toss them in the washing machine, add a cup of vinegar, and run the washer on its hottest setting. Once the load is done, run the towels through another cycle using regular laundry detergent. 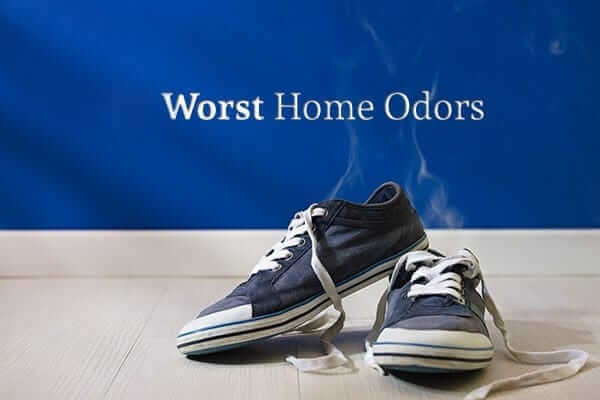 Of course, one of the best ways to keep many of these odors from building up is to regularly clean your house. If you don’t have time to clean it yourself, Love My Maids can help. Their team of licensed and bonded maids will clean your home as often as you need so that you can enjoy a clean home and more free time.